A novel method for curing corals suffering from bacterial infections is the use of phage therapy. Bacterial viruses (bacteriophages or phages for short) have been used for treatment of human diseases with varied success and more recently within aquaculture for treating farmed fish diseases. The main advantages of phage therapy, particularly with corals, are potential host specificity and the fact that viruses self-replicate so any treatment would continue over large time scales with only minimal initial treatment doses, alongside the overall environmental safety of this particular type of treatment. The phage only attacks and destroys specific pathogens, leaving the beneficial bacteria within the coral holobiont unharmed. To date, phage therapy has only been considered for two main types of coral disease; tissue lysis of Pocillopora damicornis by Vibrio coralliilyticus (Ben-Haim & Rosenberg, 2002; Ben-Haim et al., 2003b); and white plague-like disease affecting several large coral species including Favia favus, Platygyra sp. and Goniastrea sp. thought to be caused by Thalosomonas loyaeana (Barash et al., 2005; Thompson et al., 2006). 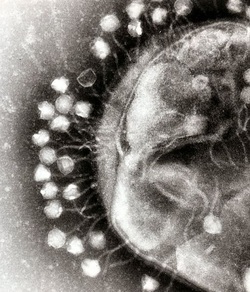 Yet for phage therapy to work in the first place, the causal agent must be known to be the sole causal agent and as this is in some debate for all coral diseases including WS in this case (Ainsworth et al., 2008; Lesser et al., 2007), these forms of treatment remain highly controversial. Despite this, Efrony et al. (2007) demonstrated that inoculation of specific phages at the same time as the inoculation of a proposed bacterial pathogen, inhibited infection in colonies within the aquarium environment (Efrony et al., 2007). It was concluded that phage therapy may be a more valuable tool in preventing the spread of diseases, rather than curing infected corals. This was supported by the fact that phage therapy used in a control environment prevented the transmission of a disease from diseased corals to apparently healthy specimens (Efrony et al., 2009). However as with antibiotic treatments, exposure to phages can often select for resistant bacterial mutants. 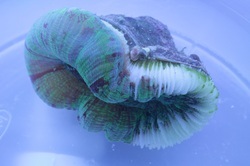 In some cases, physical damage, over shading or stinging from other corals can cause loss of tissues on many species as seen in this Trachyphyllia geoffroyi. In these instances this manifests itself as one of the White Syndromes. This is why it is important to be sure that the disease lesion is progressing before it can be clearly identified as a specific disease. This has caused many problems in the wild with studies claiming to be analysing WS but really looking at corals suffering from predation, storm damage etc. Monitor your corals over the course of a day as most diseases are relatively rapid will enable you to see the lesion advancing. Using time-lapse photography as we do here, is a nice way to show this tissue loss (or lack thereof in this instance) and again helps with identification of the disease. New Cure for White Syndrome and White Band in your tanks? New research from the University of Derby, and published in the 'Proceedings of the Royal Society B' looks closely at the microbes involved in certain diseases known to be killing corals. Specifically White Band Disease (WBD), known to affect corals in the Caribbean, and White Syndrome, the dominant coral killer in the Indo-Pacific and Aquariums worldwide. For over 40 years, the pathological agents remained unknown so Dr Sweet's team took a different approach to that taken in previous studies, and decided to take already diseased coral and use antibiotics to cure them (as opposed to infecting healthy coral with the disease and examining the implications of the infection). Using a process of elimination he was able to understand which microbes were to blame, at least in this Caribbean coral under examination. The study involved 4 different antibiotics, and 2 of these were found to successfully treat the diseased corals. 'The disease causing microbes we were trying to knock out, were present in the diseased coral and the antibiotic treatments which didn't cure it, but it would not be present in the healthy coral, nor the two antibiotics which cured it,' says Sweet. In this instance they found three types of bacteria were at the root of WBD, as well as a microorganism called a ciliate; in particular a species called Philaster lucinda. There are very significant similarities to the microbiota on corals and that of the the human body, particularly the human gut. Sweet explains that the bacteria involved in WBD works by hindering the immune system of the coral; reducing its efficacy by factors such as a reduction of the number of defensive stinging cells and the inability to produce the energy expensive mucus (a first line of defense for reef building corals). After this initial weakening of the immune system, the ciliates attack the tissue of the coral. 'It's a bit like when you have a cold and due to your weakened state you become more vulnerable to other diseases in the surrounding environment', he says. Although the antibiotics were able to cure the WBD in these corals, Sweet and his team do not advocate the use of antibiotics for corals in the wild, stating that this could lead to antibiotic-resistant microbes and superbugs in the future. The World Health Organisation wants this high up on the agenda, and it is quite rightly, a topic seeing more and more focus at the moment. Perhaps this is why Sweet suggested developing a probiotic as opposed to an antibiotic, to support the coral's immune system and 'let the coral fight off the pathogen itself.' However there is scope to utilize these antibiotics in the aquarium as long as controlled measures are strict. Don't flush water laced with antibiotics down the toilet as out sewage systems can't cope with this and the antibiotics end up directly into the systems we are trying to keep them out of.